The CR valve is a direct operated pressure control valve cartridge type that can be used in blocks or panels with type D-10B seat. 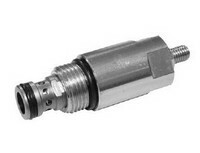 The CRQ valve is a pilot operated pressure control valve cartridge that can be used in blocks or panels with D-10C type seat. 7/8-14 UNF-2B (SAE - 10) type seat.